Technology offers diversity of options for power producers to maintain a low cost, balanced generation portfolio. In a world that will continue to rely upon fossil fuels, technology enables the responsible use of our coal and natural gas resources while supporting our nation’s – and the global – need for reliable, secure and affordable energy. CURC has developed and proposed a comprehensive set of actions to ensure that cost-effective, commercially tested technologies that will enable transformational changes in the way coal and gas are converted to energy are developed. The proposed set of actions are designed to augment industry’s R&D efforts by encouraging incentives and addressing technical, regulatory and financial risk barriers to new technology deployment. The outcome of such a program would promote adoption of near-commercial scale technologies by advancing technologies to avoid the “valley of death” where, under current conditions, technology developers do not have the financial or public policy support needed to move promising technologies beyond the laboratory. The existing fleet of fossil fuel plants has powered this nation for generations, and today is the backbone of our affordable, reliable electricity. 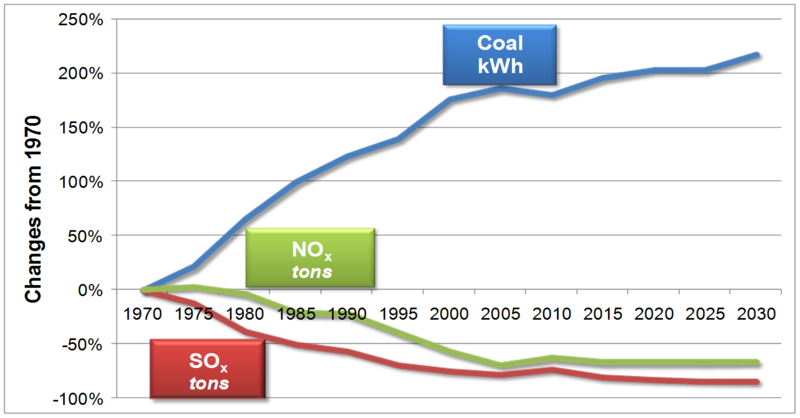 The below figure shows how coal use grew significantly since 1970 while technological advances led to impressive reductions in emissions of criteria pollutants. The existing coal and natural gas fleet currently powers two-thirds of the nation's electric generation at a low cost. As you can see below, U.S. electricity prices remain well below those of other free market nations. How do we preserve the value of the existing fleet? Fossil fuels will continue to be an essential energy option both at home and abroad. They are necessary to maintain fuel diversity, which keep electricity prices affordable and provides security to supply our energy needs. It's not just fossil fuels, however - all sources of energy are needed, and all face challenges. Nuclear energy faces high construction costs and challenges with waste disposal. Renewable energy sources are intermittent, and without cost-effective and scalable storage solutions, are subject to reliability issues caused by weather disruptions and regional availability. Technology will enable power generators to retain the benefit of diversity in their generation portfolio and enable our abundant fossil fuel resources to be part of a low carbon future. However, federal incentives currently focus on renewable energy resources, which will not ensure a diverse portfolio of energy technologies are developed. How do we enable investment in new advanced fossil fuel technologies? Fossil fuels remain the most affordable and fastest growing energy resource in the world. In emerging economies around the world, coal is the primary source of power that will be used to grant access to electricity to the approximately 1.3 billion people on the globe that currently do not have it because access coal is low cost, reliable and accessible. There is an opportunity for the United States to lead the global growth in fossil fuel use through exports of commodities – our fossil fuels, and the export of new, cost competitive electric generation technologies. Exporting U.S. technologies is the surest way to mitigate the emissions of carbon dioxide (CO2) while ensuring that the U.S. does not cede a leadership role in this potentially lucrative field to other nations. Domestically, we have an opportunity to capitalize on the immense economic and energy security benefits of using captured carbon dioxide to recover over 200 billion barrels of domestic crude oil that can be recovered using this technology, leading to significant economic benefits. 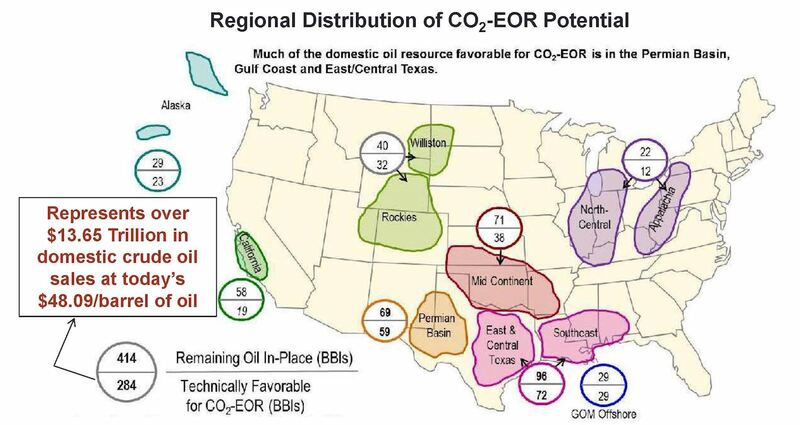 Carbon dioxide (CO2) produced from fossil fuel generation is a valuable commodity for use in recovering oil through EOR and there is a growing need for anthropogenic sources of CO2 to supply a growing, domestic EOR industry. Technology to capture CO2 from fossil fuel generation will provide low cost CO2 necessary to produce crude oil, as well as reap the benefit from the continued utilization of our vast coal and natural gas reserves. How do we position the U.S. as a leader in the global fossil fuel market?